Industrial process heating furnaces and ovens are enclosures designed to deliver heat to a load using many forms of heat processing. The purpose of a heating process is to introduce a certain amount of thermal energy into a product, raising it to a certain temperature to prepare it for additional processing, change its properties, or some other purpose . To carry this out, the product is heated in a furnace or oven. Industrial heating applications encompass a wide range of temperatures, which depend partly on the material being heated and partly on the purpose of the heating process and subsequent operations. Melting metals requires very high temperatures of up to 2900 degrees Fahrenheit. Some industrial processes, such as drying and polymerizing, can require temperatures as low as 300 degrees Fahrenheit. Heat is generated in furnaces to raise the temperature of the enclosure to a temperature somewhat above the temperature required of the process. Fuel fired furnaces, which require some type of combustion, are the most widely used. Electric furnaces are used in certain applications where they offer advantages that cannot always be quantified directly by fuel cost; however, the most heavily used method in industrial applications is direct-fired combustion type burners. 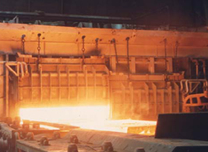 The nature of the fuel or heat source may make a difference in the furnace design, but most modern industrial furnace design is less dependent on the nature of the fuel. The following recommendations outline the some common ways to effectively save energy within a process heat system specifically furnaces and ovens. Some of these suggestions involve recovering waste heat, improving combustion efficiency, and insulating hot surfaces. It also includes a recommendation to reduce the openings for batches and/or time these ports are open. For most heating equipment, a large amount of the heat supplied is wasted in the form of exhaust or flue gases. These losses depend on various factors associated with the design and operation of the heating equipment. In most process heating applications, a large amount of the heat supplied is wasted in the form of exhaust or flue gases. In some cases the combustion products can still contain up to half of the thermal energy input into the system. This amounts to close to 50% waste-gas loss. The thermal efficiency of a heating system can be improved in one method by using the heat contained in furnace flue gases to preheat the combustion air going to the burners. A heat exchanger placed in the exhaust can transfer the thermal energy of the flue gas to incoming combustion air. Reducing the temperature of the flue gases will decrease flue gas losses, producing energy savings, and reusing the thermal energy in the flue gases will reduce the amount of purchased fuel the furnace requires. Savings from these kinds of recommendations can range from 6% to 25% depending on the method of heat recovery. Cost for exchangers and duct work can make this implementation expensive, but depending on the level of system inefficiencies , it can still be justifiable. Each fuel has a chemically correct (stoichiometric) amount of air required to burn it. Operating a heating system with an optimum amount of excess air will minimize heat loss via the flue gases. Inefficient operation can leave fuel unburned if too rich but sends too much hot gas out the stack if too lean. In addition, the O2 content is a measure of the combustion efficiency. Decreasing the O2 content without compromising the process itself can result in energy and cost savings. Additionally, reducing the amount of excess air within the flue gas will result in energy savings while maintaining the desired heat output or temperature within the furnace. Depending on the temperature of the exhaust gas and general system inefficiencies, the potential savings can be significant ranging from 10% and even up to 40% in some cases. These implementations can offer an attractive payback with low implementation expenses. The addition of more insulation over hot spots could reduce the energy lost to the surroundings. Reducing the heat load in the furnace by eliminating heat losses to the environment can result in energy savings. The energy savings from insulating exposed enclosure surfaces are low, but the relatively low implementation cost associated with this efficiency improvement project allow for short payback period. The biggest radiant energy loss in furnace operations comes from leaving doors open longer than necessary or leaving doors partially open to accommodate a load that is too large for the furnace. Furnace openings not only waste energy through radiation losses, they also allow ambient air to enter the furnace and cause hot furnace gases to escape if the furnace pressure is not controlled. For openings such as a sight glass, use a damper or slide valve to block radiation when using the sight glass. These measures can reduce the radiation heat losses and reduce fuel cost. Savings from these projects can cover a wide range and so can the associated implementation cost and payback. Consideration should always be taken to insure that current production practices do not consume energy unnecessarily.